Next-generation consoles? We care more about next-generation music-making. In that spirit, CDM’s resident game composer and gaming + music columnist W. Brent Latta checks in with a look back at last year’s greatest game scores and trends, with a glimpse of what this year could hold. -Ed. Greetings and Happy New Year CDM Game Audio readers! 2005 was a great year for CDM overall, and it marked the inception of this column back in May. While our existing Mambo CMS makes it somewhat difficult to search for specific gaming articles, I’m excited about the new system Peter is going to be putting into place. The site has grown by leaps and bounds, and it truly deserved a facelift and new backbone! On the gaming front, I have plenty in store for you in 2006, from software and soundtrack reviews, interviews, and the latest news and rumors. Hot on the heels of the Xbox 360 launch, and with two major console launches planned, I’m certain this will be a year to remember. But lest we forget the highlights, I’ve compiled a brief roundup of 2005’s most important news and events in the world of Game Audio for your reading pleasure. Myst V: End of Ages by Tim Larkin – An outstanding effort in this final episode of the legendary Myst saga. Tim pays homage to many previous Myst themes while adding his own sonic signature. This has become one of my favorite soundtracks and is in heavy rotation. Jade Empire by Jack Wall – A brilliant work by an industry legend, Wall (pictured) pulls together styles from East and West into what could end up on the GANG list of nominees for Best Soundtrack. Advent Rising by Tommy Tallarico – Right up there with his contemporary, Jack Wall, Tommy has created what may be his finest score to date. Resident Evil 4 – various – Available as part of the Biohazard Collection in Japan, this soundtrack really stands out for me because this was one of the finest gaming experiences I had in 2005. A brilliant game all around with stellar gameplay, excellent sound design, and a haunting soundtrack. 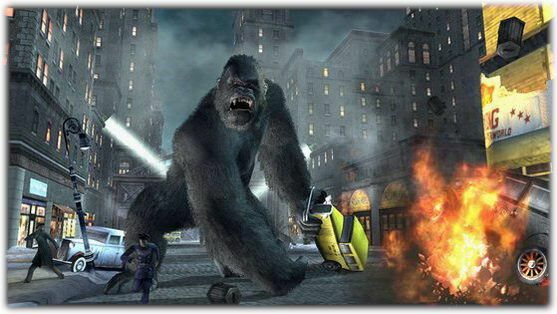 King Kong by Chance Thomas – Many fans now claim that Thomas’s score outshines that of his Hollywood counterpart, James Newton-Howard. 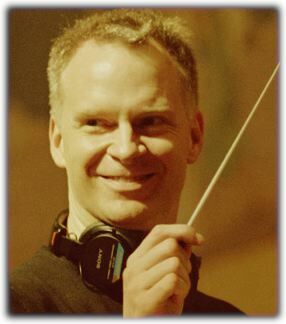 God of War – Gerard Marino – One of several composers for this soundtrack, Marino contributed the bulk of the music for this title, which is considered by many to be one of the finest titles available for the PS2. Honorable Mention: Electroplankton and Guitar Hero – These titles deserve their own category, to be truthful, but regardless they are standout titles. Not because of their soundtracks, but because making music is the focal point of the games themselves. If you want to check out a unique handheld music-making title, Elektroplankton will be available in the US in January. Guitar Hero is available now at your game retailer – and, hey, who doesn’t need a little guitar karaoke now and then? 2005 was the year that saw live video game music music take off. With such events as Video Games Live and the Final Fantasy: Dear Friends concerts, music in games finally began to step out of the shadows as a fringe media. Several other game-music concerts have been announced around the world and we expect to see more and more of this type of thing in the coming year. The Xbox 360 has fully set the stage for next generation gaming. Anyone who has seen a demo kiosk or console in action can vouch for the systems graphic capabilities. Unfortunately, little has yet been reported in regards to the audio facilities of the 360, though I attribute that to the relatively lean number of launch titles and the extremely limited availability of the hardware. Over the next several months, I expect we’ll begin to get a much better picture of what doors have been opened with this latest platform. With Sony and Nintendo launching consoles this year, I expect we’ll see more significant investment by publishers and developers in game audio. Hopefully this may help dispel the tired belief that audio in games is still bleeps and bloops. Thanks for a great year, everyone. I look forward to sharing more with you in the coming year!